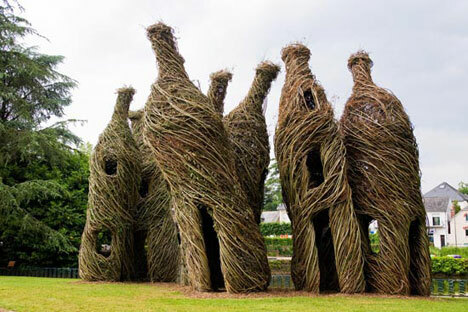 No artist I can think of puts nature smack-up against culture like Patrick Dougherty. Since the mid 1980s, when site-specific sculpture first caught hold, Dougherty, 65, has traveled the world making large-scale temporary works built on-site from willow and other pliable species he gathers nearby. Fusing the techniques of birds and basket makers with the chaotic forms found in nature, he’s built than more 200 sculptures whose densely woven, free-flowing arabesques recall hunter-gatherer dwellings magnified to Brobdingnagian proportions. 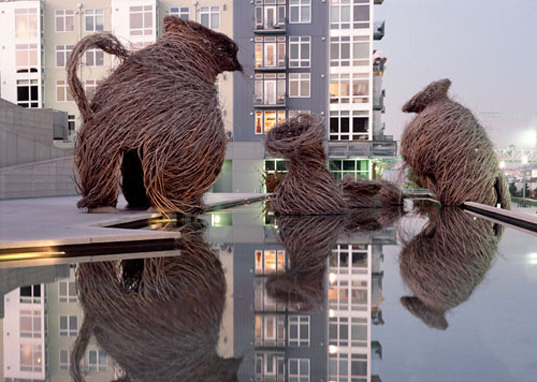 These “Stickworks” as Dougherty calls them, have appeared in parks, wilderness areas, farms, urban buildings, museums and public spaces throughout the U.S., Europe and Asia. They’ve sprawled parasitically, like jungle-consuming vines across the facades of buildings and into trees; burst through windows like storm waves; huddled in freestanding groups recalling wind-blown teepees; mimicked groves of alien giants; spiraled down stairwells and across lobbies; and, in general, amazed viewers by confusing the boundaries between the “built” and the natural environment, fine art and craft. Each of his works appears to have sprouted organically from its surroundings, and it’s that challenge, of integrating the works into specific sites, that animates Doughtery’s practice. For the installation he just completed at the Palo Alto Art Center, Doughtery began by trucking in sticks from The Willow Farm in Pescadero. In front of a group of trees that abut a busy intersection, he drilled holes in the ground and inserted a series of saplings in a zigzagging line. This created a structural armature onto which the willow branches were affixed in curving, tightly woven thickets, leaving room for porthole-like windows and a path running through the center. The resulting structure – crowned by cantilevered domes and festooned with snaking ornamental trimming — looks like something druids might have inhabited. Like Andy Goldsworthy, Richard Long, Herman de Vries, Chris Drury, Giuseppe Penone and artists of similar ilk, Dougherty believes that nature is the locus for artistic expression. But unlike them, he operates almost entirely outside the commercial mainstream. He doesn’t show in galleries and he doesn’t make “public art”. Instead, he contracts exclusively with municipalities, museums and other sponsoring agencies. In exchange for a work of art that will either be dismantled after a year or allowed to disintegrate over time, they give Dougherty a stipend, a car, a volunteer crew and living quarters for three weeks: the time span in which he completes all of his projects. His schedule – three weeks on, one week off — is booked several years advance. A driven, yet highly personable man, Dougherty speaks in articulate, perfectly formed paragraphs that run together almost breathlessly. A master storyteller, his infectious energy and loquacious North Carolina manner endear him to strangers and to children in particular, who take to him as readily as they do to computer games. The same goes for the adult volunteers he relies upon to sustain his enterprise. With only a little hands-on guidance from Doughtery, they quickly learn to bend and weave sticks into the contours he outlines in rudimentary sketches. Stickwork, he maintains, is an instinctive process embedded in everyone, and he delights in seeing it activated. Squarecylinder thanks John Yoyogi Fortes for creating the video profile “Sticks”, about the making of Patrick Doughtery’s installation at the Palo Alto Art Center, on view through Jan. 30, 2012. 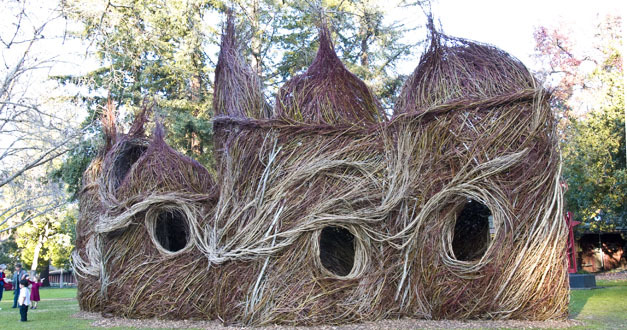 Learn more about Patrick Dougherty.